Thought Edith Wharton is best known for her cutting contemplation of fashionable New York, Ethan Frome and Summer are set in small New England towns, far from Manhattan’s beau monde. Together in one volume, these thematically linked short novels display Wharton’s characteristic criticism of society’s hypocrisy, and her daring exploration of the destructive consequences of sexual appetite. 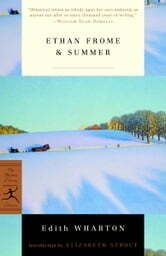 From the wintry setting of Ethan Frome, where a man hounded by community standards is destroyed by the very thing that might bring him happiness, to the florid town of Summer, where a young woman’s first romance projects her into a dizzying rite of passage, Wharton captures beautifully the urges and failures of human nature.